Looking for a place to ride with the kids? 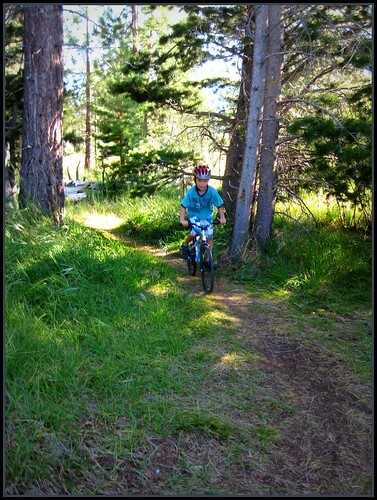 One of the best family riding spots up at the Lake is along the south shore. There are many destinations, events, and starting points, so it’s easy to customize the ride for a different experience each time. One of the best things about this area, is that you can have a lot of fun but not spend a lot of money. Near the Camp Richardson area are free beaches, nature hikes, historical sites, ice cream, and other fun things to do. All accessible by bike paths! My favorite place to park with kids is just before you get to Camp Richardson on highway 89. There is a dirt pullout on the lake side of the road, and the bike path is just beyond the bushes. There is almost always parking here, and you don’t have to get into the traffic jams of the Camp Richardson area. Parking area centered on the map HERE. Following the bike path towards Emerald Bay allows you access to Pope Beach, Kiva Beach, and Baldwin Beach. 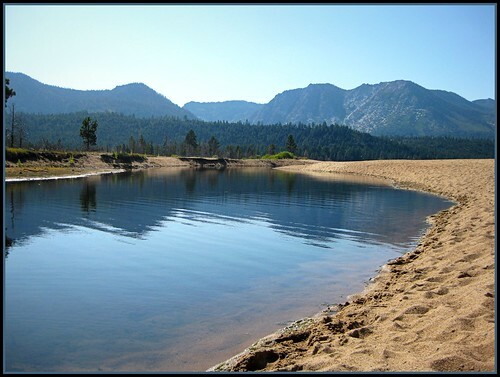 My favorite beach is west most portion of Kiva Beach where Taylor creek flows into Lake Tahoe. 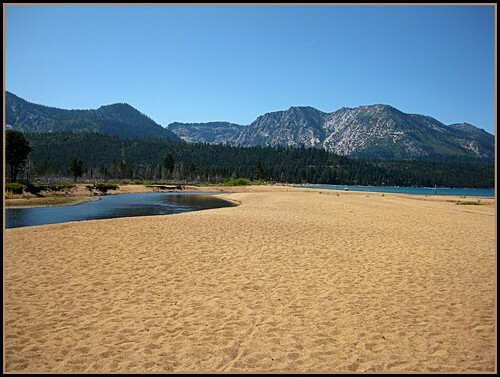 There is a narrow strip of beach here, and the kids can play both in the creek and in Lake Tahoe. It’s not usually crowded here either. Another side trip along the bike path is the Tallac House Historical Site. There are many historical buildings to view here, and many times there are special events going on. This is also a good spot to refill water bottles or use the restroom. The Taylor Creek Visitor Center also makes a good destination, especially in the fall when the Kokanee salmon are spawning. 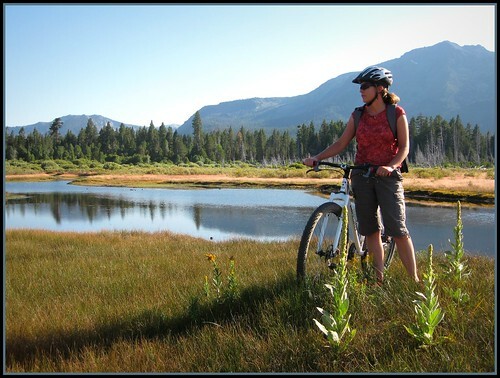 You can ride to the visitor center, lock your bike, and hike the trails. The nature trail to the Stream Profile Chamber is a must see. The profile chamber gives you an underwater view of the trout and salmon that swim Taylor Creek. 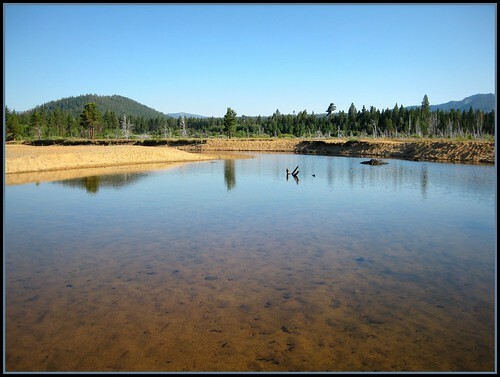 On the other side of highway 89, Fallen Leaf Lake is just a short ride away. Additional exploring can be had on the trails along the north shore of this neighboring lake. 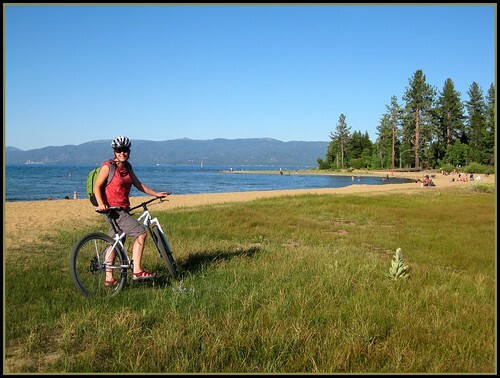 The Lake Tahoe Bicycle Coalition is your best bet for cycling information in the Lake Tahoe area. They have great maps and other helpful online information. 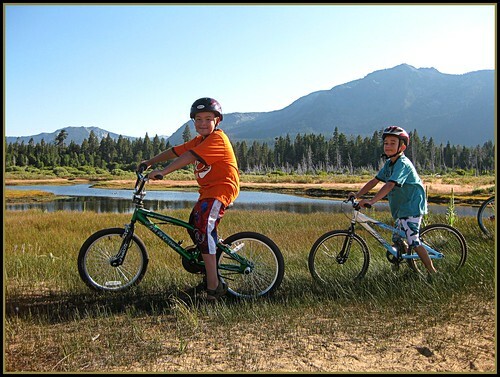 For riders looking for more mileage, you can park at the casinos on the Nevada side, and make your way over to Camp Richardson along bike paths and bike routes. And finally, keep an eye on the ice cream shop at Camp Richardson. If the line isn’t too long, ride across the street and get a cool treat. They serve giant scoops for hungry explorers.